Originally, research into speech acts and their theoretical frame­work(s) was mainly developed in the context of the English language, while suggesting universal application of certain parameters across the world’s languages. In the meantime, this universality has been called into doubt by research findings based on empirical work being carried out in speech communities all over the world. As a consequence, in­tercultural pragmatics has become an important field, showing, among other things, the cultural relativity of concepts such as speech act framing, social distance and balance, directness / indirectness and po­liteness / face. However, African languages and cultures are still an under-researched area in this respect. Therefore, this proceedings volume aims at exploring in more detail how speech acts and speech events are embedded in different socio-cultural contexts in Africa, and how how they are linguistically encoded in various African languages. An Explanation of the Prohibitive in Hunde, Havu and Shi? Although the book is not pioneering in the subject of speech acts in African context, the topic has not been extensively studied so far. There are a few studies that contrasted speech acts in English and other African languages. Most of them concern South African English, Zulu and Xhosa. The value of the book lies in paying attention to some aspects of pragmatic theory that have been presented as universal, but can be easily contradicted by particular examples taken form [sic!] the languages of Africa. 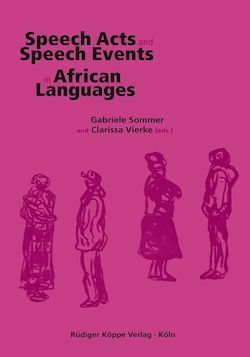 Another important contribution of the book is to present detailed case studies of speech acts, that could be interesting not only for those making research in African studies, but also for linguists dealing with pragmatic theory.